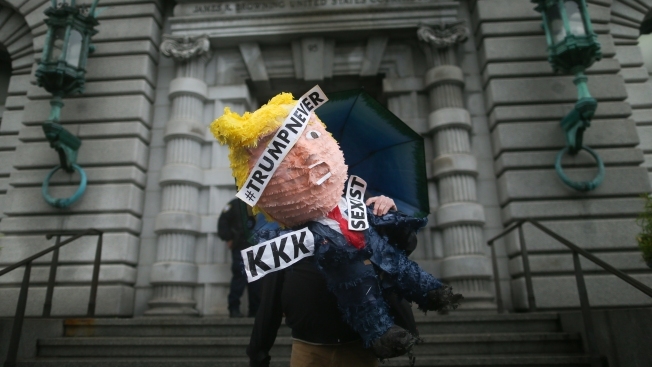 In this file image, a man holds a paper mache Donald Trump prop adorned with signage outside a federal appeals court in San Francisco. In a single day, the Jewish Bar Association of San Francisco picked up nearly $25,000 worth of support for its unconventional opposition of a right-wing rally proposed for next weekend at Crissy Field. A GoFundMe campaign titled "Adopt-a-Nazi (Not Really)" aims to protest Patriot Prayer's Freedom Rally San Francisco by raising money for the Southern Poverty Law Center, a nonprofit activist group that tracks civil rights, hate crimes and combats extremist groups. The idea came from Cody Harris, a boardmember of the JBASF, which, according to a news release represents "500 attorneys and businesspersons of different races, backgrounds, and ethnicities" in the Bay Area. Harris told NBC Bay Area that he was inspired by the story of Wunsiedel, a small German town that in 2014 "decided to combat an annual neo-Nazi march through town by donating money to an anti-extremist group for every marcher." The parade descended on the town to honor prominent Nazi politician Rudolf Hess, who was sentenced to life in prison at the Nuremberg trials for helping plan World War II. He died in 1987 and was buried in Wunsiedel until authorities removed his remains. Similarly, on the cusp of Aug. 26's rally, the JBASF is asking people to donate a penny, a dime, a quarter, a dollar or whatever they can afford to the Southern Poverty Law Center. Harris, like many others, isn't buying it. "These extremist groups are spoiling for a fight," he told NBC Bay Area. "They are basically trolls – they want a reaction, they want violence in the streets. It serves their purposes. Decent Americans cannot respond like that, tempting as it may be. We instead must channel our anguish and anger towards something positive. This campaign is an easy way to do that." The campaign, which was trending on Saturday, has gone viral. The initial goal amount was $10,000, but 895 people poured in nearly $60,000 in just two days, prompting Harris to bump the target up to $75,000. Other than aiming to "raise a pile of money" for the Southern Poverty Law Center, Harris is hoping that Bay Area residents will "feel empowered to stand up against hateful and extremist agitation in a peaceful and productive way." According to Harris, the group of lawyers upholds the Constitution and First Amendment, which affords even Nazis the right to speak their minds. However, lawyers are also tasked with defending "civil liberties, equal protection, and due process," he pointed out. Harris recalled being "repulsed" by the violent rally in Virginia that attracted white supremacists, neo-Nazis and members of the Klu Klux Klan, and claimed three lives. In response, Harris reaffirmed his commitment to protecting the law. "White nationalists may feel emboldened, but they will never prevail," he said. "There are far more decent people dedicated to this country’s founding creed than there are white nationalists. "The key is to respond to them firmly and non-violently, starving them of the oxygen their ugly fire needs to spread." NBC Bay Area has reached out to Patriot Prayer for a comment and is awaiting a reply.